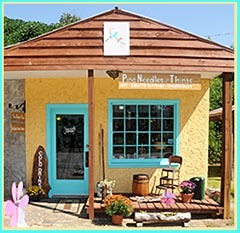 Pine Needles & Things is an eclectic shopping experience. You will find a variety of Pine Needle Work, as well as a variety of other Art, Antiques, Vintage Clothing, Farmhouse Furniture and decor. We also have Specialized Jewelry, Glassware, Colorful Bottles, Unique Gifts, as well as Unusual Finds, if you are looking for the unusual, try us first...we might just have what you are looking for. You never know what you might find, new items arrive daily at the shop, so you'll want to come back again and again! Carmen Haynes enjoys long walks with her husband and dog, foraging for the perfect long leaf pine needle. "It's relaxing and peaceful and I feel a sense of being one with nature and a closeness with the creator of all things." Carmen selectively hand picks each pine needle one by one, then takes them home to their small cabin, where she washes, dyes, dries, and bundles them. 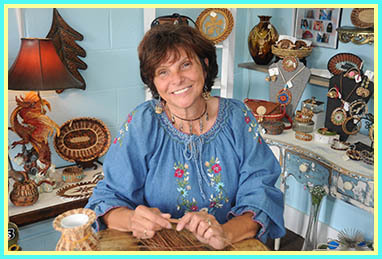 She then spends hours of loving labor creating baskets, bowls, jewelry and what-knots. "Each piece takes on a form of its own. I have an idea of how I would like the piece to look like, but the size, shape, and color just develops as I go along. There are never two pieces alike, each one is a unique work of art." Pine Needle Basket Supplies...Long leaf pine needles, washed and ready to be used. 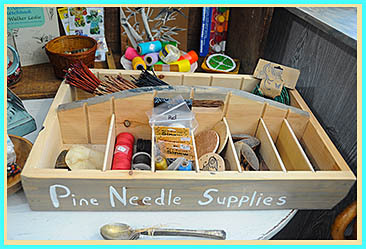 We also have dyed pine needles in a variety of colors, waxed threads and colorful artificial sinew. You can choose form a variety of wood bottoms and center starters. Two day Classes are offered in a fun and relaxing environment where we can meet new people and make new friends. At the end of the class you will have finished a small 6 to 8 in. basket and eager to begin another one. The Pine Needle Basket Guild meets once a month during the warmer seasons, under the covered pavilion just outside the shop. Bring your baskets for show and tell. We meet to swap ideas, and learn new methods and stitching. Come see me next time you are in Western North Carolina. We are just around the corner from John C. Campbell Folk School. The Florida Indians were one of the first to create Pine Needle baskets using sharp pieces of bone or shell and tall grass to coil their long pine needles into useful containers. I individually design and hand-coil each creation. No two are exactly alike. Great care and time go into each labor of love. I look to the ground and carefully select each fallen pine needle as if they were calling out to me. Most, would think of them as useless, and dirty. A chore to be gathered up and thrown away. Instead I gather them, wash them, and coil them into unique and beautiful creations. Each time I do, I am reminded of our creator, Father God, whose eyes search throughout the whole earth looking for people who will call out to Him. Some appear to be useless, broken and dirty with the sins of this world. But He gathers them up, washes them, and lovingly cares for them. And in time, God creates something uniquely beautiful and useful in each of us. Baskets symbolize gatherings. I pray that your pine needle creation from PINE NEEDLES & THINGS gathers many blessings for you and your loved ones.